Our world is all for the build-up to Christmas. Stores put out decorations months in advance - craft stores give everyone a chance to put together a personalized gift before the leaves begin to change colors - kids start learning carols for school programs weeks into the school year. And yet, the same world almost mocks the forty days of preparation for Easter - Lent. While there are many who have scars from the human side of the church, please take a moment to prayerfully consider spending these forty days focusing on one part of your spiritual health in preparation for Easter - the single most important event of Christianity. There is no judgment in this - just a chance for reflection with your Lord and Savior. I am giving you a free sheet to help you stay motivated - check out each day as you walk through the Lenten season. 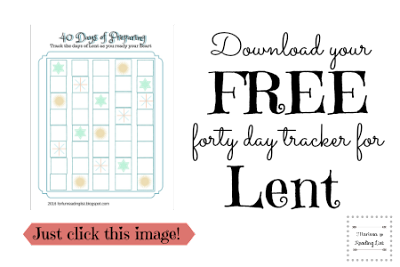 Use it with your kids - let them put a sticker in each square as you get closer to the day of our Lord's resurrection. There is also a place for you to write your own memory verse or inspiration. Make it your own. Grow in your faith. Experience Easter this year with a rejuvenated faith. For more food for thought on focusing your spiritual disciplines, I'm leaving a few links you are welcome to check out. Practical steps towards spiritual discipline - check out some common forms of spiritual discipline and how to take steps to being more disciplined. Hope to pull you through - a wonderful song by Colton Dixon to help build up your hope.